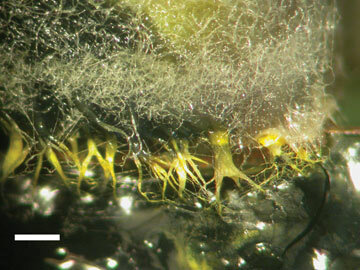 Some fungi that live in soil and in association with plant roots can transform depleted uranium into stable minerals. Depleted uranium, the weakly radioactive byproduct left over from uranium enrichment, has proven to be quite useful in making military ammunition. But firing this ammunition — as has been done recently in wars in Iraq and the Balkans — can deposit that uranium into the soil, where it can find its way into plants, animals and water. Although only weakly radioactive, depleted uranium can still be toxic if inhaled or ingested. Fortunately, the solution to cleaning up this hazardous metal may already be in the dirt: New lab experiments show that certain fungi can transform depleted uranium into stable minerals that are likely to stay put rather than spread throughout the environment. The fungi did not disappoint. Gadd and his colleagues found that natural moisture and oxygen in the soil samples corroded the depleted uranium, making it an attractive spot for fungi to colonize. Then the fungi themselves corroded the uranium with acids and other substances that they normally excrete during metabolism, Gadd says. Once in the soil, some of the dissolved uranium interacted with phosphates to produce types of uranyl phosphate minerals. These minerals are more stable than depleted uranium and less likely to break down thus trapping the uranium for a long time, the researchers reported in Current Biology on May 6. Gadd was “quite pleased” by the results, but says it is too soon to say exactly how, or if, fungi can be used to clean up depleted uranium. And he isn’t sure this process could be used just anywhere. The natural features of a soil — such as its moisture content and available nutrients — play an important role. For example, Gadd notes that in desert locales where soils are dry, this transformation may not happen. The next course of action, Gadd says, is to study the uranyl phosphate minerals in more detail to determine exactly how stable they are and what processes break them down.